Early Control of PTH and FGF23 in Normophosphatemic CKD Patients: A New Target in CKD-MBD Therapy? Background and objectives: Levels of parathyroid hormone (PTH) and the phosphaturic hormone FGF23, a fibroblast growth factor (FGF) family member, increase early in chronic kidney disease (CKD) before the occurrence of hyperphosphatemia. 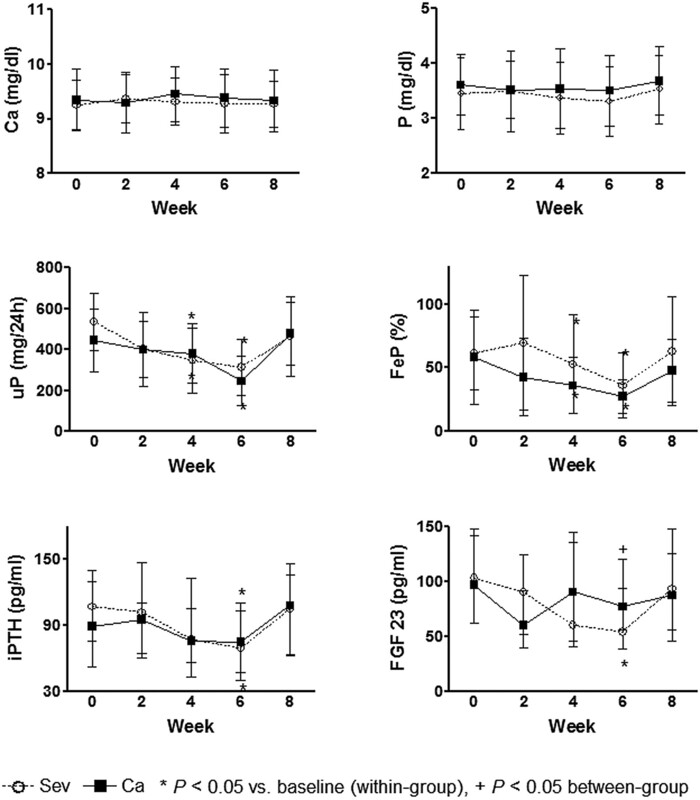 This short-term 6-wk dose titration study evaluated the effect of two phosphate binders on PTH and FGF23 levels in patients with CKD stages 3 to 4. Design, setting, participants, and measurements: Patients were randomized to receive over a 6-wk period either calcium acetate (n = 19) or sevelamer hydrochloride (n = 21). Results: At baseline, patients presented with elevated fractional excretion of phosphate, serum PTH, and FGF23. During treatment with both phosphate binders there was a progressive decline in serum PTH and urinary phosphate, but no change in serum calcium or serum phosphate. Significant changes were observed for FGF23 only in sevelamer-treated patients. Conclusions: This study confirms the positive effects of early prescription of phosphate binders on PTH control. Prospective and long-term studies are necessary to confirm the effects of sevelamer on serum FGF23 and the benefits of this decrease on outcomes. Mineral metabolism and bone disorders (CKD-MBD) are associated with poor outcomes in dialysis patients, but few studies have evaluated their effects in chronic kidney disease (CKD) patients who are not yet on dialysis. Moreover, studies have shown that complications such as vascular calcification, CKD progression, and mortality are associated with serum phosphate levels within the upper limits of the normal range (1,2). In addition, increased parathyroid hormone (PTH) levels occur early in CKD patients, accompanied by normal serum calcium and phosphate (3). Recent studies indicate that the phosphaturic hormone FGF23, a fibroblast growth factor (FGF) family member, may play a role in early CKD (4). FGF23 is primarily produced by osteocytes and directly acts on the kidney to downregulate the production of 1,25-vitamin D3 and the expression of the 2a and 2c sodium-phosphate cotransporters (5) in response to phosphate overload in healthy individuals (6) and in patients with CKD (7). Growing evidence indicates that rising FGF23 levels in early stages of CKD are partially responsible for maintaining phosphatemia within the normal range. Early management of serum FGF23 levels may prevent the premature decrease in serum 1,25-vitamin D3 and the subsequent increase in serum PTH. Beneficial effects of lowering FGF23 levels are suggested by the correlation between FGF23, vascular calcification, CKD progression, and mortality (8–10). These current concepts indicate that early treatment of CKD-MBD may result in improved management of CKD progression and associated complications such as vascular calcification. However, no studies have evaluated the effects of phosphate binder administration on serum phosphate and PTH in normophosphatemic CKD patients. The objective of this pilot study was to evaluate whether the administration of two different phosphate binders (calcium acetate or sevelamer hydrochloride) would alter biomarkers of mineral disorders, including serum PTH and FGF23 in CKD patients not yet on dialysis. The study included adult, clinically stable patients with phase 3 or 4 CKD from the Uremia Outpatient Clinic of the EPM-UNIFESP Nephrology Department. Excluded were patients who had a body mass index <17 or >37 kg/m2, proteinuria >3.5 g/24 h, diabetes mellitus, intact PTH >500 pg/ml, or were receiving any drug that could interfere with mineral metabolism. Informed consent was obtained from all patients. This study was approved by the local ethics committee (CAPPesq) and was registered on the Brazilian official trial registry (SISNEP) under the number CAAE-0714.0.015.000-07. The study was conducted over an 8-wk period, which involved 6 wk of titration of the two phosphate binders, calcium acetate and sevelamer hydrochloride, and 2 wk of washout. Forty patients were selected and randomized in a 1:1 ratio to receive open-label sevelamer (Renagel, 800-mg tablets; Genzyme Co., Cambridge, MA) or calcium acetate (PhosLo, 667-mg tablets; Fresenius Medical Care, Waltham, MA). Randomization was computer generated, in blocks of four, and the investigator assigned the treatment using concealed envelopes. After randomization, patients received calcium acetate, initially at a 1.32-g/d dose then doubled every 2 wk (2.64 and 5.28 g/d), or sevelamer hydrochloride, initially at a 1.6-g/d dose then doubled every 2 wk (3.2 and 6.4 g/d). The washout period was included as a control of the treatment because this study did not have a control (placebo) group. At the study outset and then every 2 wk, blood samples were analyzed for total calcium; phosphorus; venous blood gas analysis; alkaline phosphatase; intact PTH [chemiluminescent substrate, DPC; Medlab; reference range (RR) 10 to 65 pg/ml]; intact FGF23 (Elisa assay, Kainos, Japan; RR 8.2 to 54.3 pg/ml); albumin; 1,25-dihydroxy vitamin D (RIA, Dia-Sorin; RR 15.9 to 55.6 pg/dl); urea; and creatinine. Samples were also analyzed at study outset and at week 6 for 25-hydroxy vitamin D (chemoluminescent assay, Dia-Sorin); bone alkaline phosphatase (enzyme immunoassay, Metra Biosystem, Inc.; RR 11.6 to 42.7 U/L); and deoxypyridinoline (enzyme immunoassay, Quidel Corporation,; RR 3.25 ± 0.66 nmol/L). Urine samples were analyzed at study outset and every 2 wk for calcium and phosphorus. The seven-point subjective global assessment method was used to determine the nutrition status (11). The overall subjective evaluation method, adapted to patients with CKD, was used for the nutritional diagnosis. The dietary phosphate prescription was performed according to the amount of protein in the diet and maintained 615 ± 63 mg/d. Patients were instructed not to modify the intake of food sources of phosphorus during the 8 wk of the study. Demographic characteristics and biochemical parameters were described as mean ± SD [except for PTH and FGF23, which were expressed as median (25th to 75th percentile)]. Change from baseline was compared between treatment groups using Wilcoxon rank sum tests. Changes from baseline within groups were compared with the Wilcoxon signed rank. Statistical analyses were performed using the Graph Pad Prism version 4.0 and SPSS 10.0. A P value <0.05 was considered significant. Patients (23 men and 19 women) were randomized to each phosphate binder group. Two patients in the calcium acetate group withdrew from the study during the first week because of irregular heart rhythm and gastrointestinal symptoms, respectively, and were excluded from the analysis. Table 1 shows the clinical and biochemical characteristics of the patients at baseline. Patients were randomized to each phosphate binder group such that there were no significant differences between the two groups at baseline. The main cause of CKD was hypertension (n = 25; 62.5%), followed by chronic GN (n = 3; 7.5%), chronic pielonephritis (n = 4; 10%), and adult polycystic kidney disease (n = 3; 7.5%). In five patients (12.5%) the etiology for CKD was unknown. According to the Cockroft–Gault formula, 22 patients were classified as having CKD stage 3 (12 in calcium group and 10 in sevelamer group), whereas 18 were classified as having CKD stage 4 (7 in calcium group and 11 in sevelamer group). All patients were considered well nourished as evaluated by the subjective global assessment. Despite low phosphate ingestion (739 ± 253 mg/d), normal serum phosphate levels, and a relatively low phosphaturia, patients presented with an elevated fractional excretion of phosphate and serum PTH levels higher than normal. Mean 25-hydroxy-vitamin D was 34.8 ± 20.6 ng/ml, and all but five patients presented elevated serum FGF23 levels. The mean values of biochemical parameters observed at baseline, biweekly, and after washout are shown in Table 2. After treatment with both phosphate binders, there was a progressive decline in serum PTH, urinary phosphate, and fractional excretion of phosphate, but no significant change in serum calcium or serum phosphate in either group (Figure 1). Sevelamer-treated patients presented a greater increase in bone alkaline phosphatase and a greater decrease in deoxypyridinoline than did calcium-treated patients. Patients treated with sevelamer also presented a significant decrease in 25-vitamin D levels. No significant changes were observed in urinary calcium or in 1,25-vitamin D3 levels in both groups. However, 60% (n = 13) of the sevelamer-treated patients presented an increase in 1,25-vitamin D3 levels, whereas this increase was seen in only 31.6% (n = 6) of calcium-treated patients (P = 0.07). Absolutes changes in the levels of serum calcium (Ca), serum phosphate (P), urinary phosphate (uP), fractional excretion of phosphate (FeP), serum PTH, and serum FGF23 in patients treated with sevelamer hydrochloride (○) or calcium acetate (■) over a 6-wk period followed by a 2-wk washout period. Statistical comparisons within and between treatment groups are shown. Data are expressed as mean ± SD, except for FGF23 and PTH, which are expressed as median (25th to 75th percentile interval). Figure 1 shows the absolute changes and Figure 2 shows the percentage changes in serum FGF23 and PTH in sevelamer- and calcium-treated patients. Sevelamer patients presented a tendency to have a greater reduction in FGF23 at the 4th week than did calcium acetate patients (P = 0.06). At the 6th week, sevelamer-treated patients presented a significant reduction in FGF23 (107 pg/ml at baseline versus 54 pg/ml at the 6th week; P < 0.05), whereas this was not observed in calcium-treated patients (97 pg/ml at baseline versus 77 pg/ml at the 6th week; NS). A comparison between the treatment groups also shows a significant difference between the changes observed (−53.6 ± 64.7 pg/ml in sevelamer group versus −16 ± 49.1 pg/ml in calcium group; P < 0.05). When patients were divided according to the stage of CKD, we also observed that in stage 3 group sevelamer patients presented a significant decrease in serum FGF23 (78 pg/ml at baseline versus 51 pg/ml at the 6th week; P < 0.05), whereas this was not observed in calcium-treated patients (93 pg/ml at baseline versus 70 pg/ml at the 6th week; NS). The same findings were seen in CKD stage 4 patients [109 pg/ml at baseline versus 63 pg/ml at the 6th week (P < 0.05) for sevelamer-treated patients; 130 pg/ml at baseline versus 87 pg/ml at the 6th week (NS) for calcium-treated patients]. Percentage change in serum FGF23 and PTH levels in patients treated with sevelamer hydrochloride (□) or calcium acetate (■) over a 6-wk period. Statistical comparisons within and between treatment groups are shown. Data are expressed as mean ± SD. After the washout period, all parameters values were similar to those found at the baseline in both groups. Previous studies have shown that increased serum PTH concentrations occur in patients with CKD stage 3 who typically have normal calcium and phosphate levels (3,7). The Study to Evaluate Early Kidney Disease (SEEK) (12), a cross-sectional analysis of 1814 patients with CKD stage 3 to 5, demonstrated that calcium and phosphate values did not become abnormal until GFR fell below 40 ml/min. However, nearly 60% of patients with GFR <60 ml/min had elevated PTH levels. Despite these findings, the current guidelines only recommend a dietary phosphate restriction for these patients. In this 6-wk, dose-titration study, we demonstrate for the first time that the use of phosphate binders in early CKD patients with normal serum phosphate is effective at lowering total urinary phosphate excretion, fractional phosphate excretion, and serum PTH without significant changes in serum calcium or phosphate levels. Thus, these data demonstrate that early phosphate binder use provides additional PTH control beyond that of a phosphate-restricted diet. In study presented here, sevelamer hydrochloride treatment appeared more effective at lowering serum FGF23 levels. These findings cannot be attributed to differential control of serum phosphorus or 1,25-vitamin D3, two known regulators of FGF23. It is possible that sevelamer's increased ability to reduce FGF23 occurs through an unknown effect. In addition, these findings also raise the possibility that increased calcium load may contribute to FGF23 elevation. Serum FGF23 levels have been found to correlate with serum calcium independent of serum phosphate in individuals with primary hyperparathyroidism who underwent parathyroidectomies (13). In addition, in vitamin-D-receptor null mice, dietary calcium supplementation significantly increased FGF23 mRNA abundance (14), indicating that calcium could be another determinant of FGF23 production. On the basis of these studies, further analyses of factors controlling FGF23 production are warranted. The current understanding of the role of FGF23 is still emerging. Similar to the “trade-off hypothesis” (15) proposed for PTH, small elevations of FGF23 may have a beneficial effect by preventing hyperphosphatemia in early CKD. Over the long term, high FGF23 levels can favor the development of hyperparathyroidism because FGF23 inhibits the activity of 1α-hydroxylase, the rate-limiting enzyme responsible for 1,25-vitamin D synthesis (9). In a prospective study performed in dialysis patients with mild secondary hyperparathyroidism, serum FGF23 levels were significantly associated with the development of severe hyperparathyroidism (16). In an observational study, Fliser et al. (9) found FGF23 to be an independent predictor of disease progression in patients with nondiabetic CKD. Furthermore, FGF23 levels were a more accurate predictor of progression than serum phosphate, calcium, or PTH concentrations. Finally, a recent study has shown that FGF23 levels are independently associated with mortality among patients initiating hemodialysis treatment (10). The mortality risk associated with elevated FGF23 was substantially larger than that reported for serum phosphate. Together, these results suggest that the management of FGF23 may become an important goal in the treatment of CKD-MBD. The significant increase in bone alkaline phosphatase and decrease in deoxypyridinoline that was found exclusively in the sevelamer group could be considered as an improvement in bone remodeling of these patients. However, bone biopsies were not performed, preventing definitive diagnosis of renal osteodystrophy and only a long-term study with bone biopsy analysis could confirm these findings. In a similar way, the significant decrease of 25-vitamin D should be seen cautiously, because no other study found a sevelamer-related effect on serum levels of this hormone. The current study presents several limitations. We excluded diabetic patients, and diabetic nephropathy is a main cause of CKD. However, in our study we preferred to exclude patients with a significant proteinuria, which would certainly be associated with vitamin D deficiency, and diabetic patients would certainly present a significant degree of proteinuria. A similar decision was taken by Fliser (9), who evaluated only young, nondiabetic CKD patients in the Mild to Moderate Kidney Disease (MMKD) study and found that FGF23 was a good predictor of CKD progression. Indeed, our group also recently found that FGF23 is a good predictor of CKD progression in diabetic patients (21). Nevertheless, in a long-term, prospective study diabetic patients will necessarily be included and the benefits of phosphate binders on serum PTH and FGF23 control must be confirmed in this population. Our study is also limited by a small population size and the short duration. However, the current understanding of phosphate management in CKD leads us to propose a change in the paradigm: To move from the recommendation of the current guidelines [Kidney Disease Outcomes Quality Initiative (K/DOQI) and Kidney Disease: Improving Global Outcomes (KDIGO), which recognize the use of phosphate binders for CKD 2 to 4 patients only when serum phosphate is greater than 4.6 mg/dl] to a more aggressive control of phosphate load using phosphate binders even in the presence of normal serum phosphate values. A recent review published by Isakova (22) calls our attention to the need of a better understanding of the role played by phosphate and FGF23 in CKD, proposing to the nephrologic community a long-term study in this population. Certainly a long-term, randomized and probably multicentric study will be necessary to confirm this theory. In such a study, the long-term benefits of early binder treatment on vascular calcification, bone health, and disease progression would also be assessed. However, our preliminary findings showed that the use of phosphate binders in this population is not associated with serious adverse events in the short term. They also provided some preliminary data regarding PTH control and surprisingly showed that the FGF23 response could be distinct dependent on the phosphate binder that was used. In conclusion, the use of phosphate binders in CKD patients with normal serum phosphate levels was associated with improved control of secondary hyperparathyroidism without corresponding changes in serum phosphate levels. Sevelamer was also able to decrease serum FGF23. The benefits of these findings should be confirmed in long-term studies. Genzyme Corporation provided the funding for this trial. The investigators were solely responsible for the design, conduct, analysis, and publication of the trial. There were no restrictions on publications, and all data were maintained and analyzed solely by the authors. Drs. Canziani, Carvalho, Jorgetti, and Moysés report have received consulting fees and research grants from Genzyme. This study was presented, in part, at the 2007 Annual Meeting of the American Society of Nephrology in San Francisco, California. The authors acknowledge the assistance given by Claudia Veludo and Marianna D. Unger in the nutritional evaluation, Scott Chasan-Taber (Genzyme Co.) in the statistical analyses, Christine McKillop for assistance in preparation of this manuscript, and by Susan Schiavi and Robert Guiberteau (Genzyme Co.) for critical reading of this manuscript. You are going to email the following Early Control of PTH and FGF23 in Normophosphatemic CKD Patients: A New Target in CKD-MBD Therapy? Prevention and Control of Phosphate Retention/Hyperphosphatemia in CKD-MBD: What Is Normal, When to Start, and How to Treat?